Greetings, lovely blog readers! As you all know, books play a large and very important role in my life. They have even begun a slow but steady takeover of my bedroom. However, I have to be honest and say that T.V. is another one of my great loves. 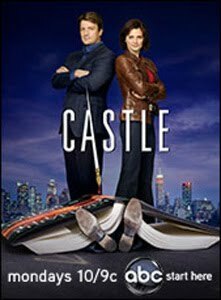 One of my favorite shows right now is Castle. Some of you may also be familiar with Adele of Persnickety Snark, who is fantastic. She recently started an entertainment blog called Snark & Bark. Adele has assembled a fabulous team of bloggers to write about various T.V. shows. For example, Sarah of Sarah's Random Musings is writing about Doctor Who. So now you ask, how are Snark and Bark and my love of Castle connected? Why, I'll be posting about Castle every Tuesday on Snark and Bark! Until season three starts up, I'll just start at the beginning of season one and work my way forward, so be sure to stop by often if you're interested in my opinions. My first post, which is all about why I love Castle, went up earlier today. Click here to read it! Thanks to Adele for assembling such a fabulous team of bloggers!